We had Blaize at the vet yesterday to fulfill your requirement of having him checked within 48 hours…. He is a perfectly healthy little guy. The vet was quite impressed with his personality. He put him down to observe him and he wandered around and checked everything out and then promptly laid down! He’s definitely laid back… but he’s not shy either! He socializes really well…..as we were staying with my parents for the weekend there were a lot of visitors coming and going. My aunt and Uncle are staying with my parents for a visit right now. My brothers and their families, including a golden retriever (of course vaccinated!) and kids, and my grandparents came for a big family supper one evening and Blaize just went with the flow. He got lots of playtime and socialization that’s for sure! He did wonderfully in the car for the 4 hour drive home…..he slept in the crate the whole way. He sleeps in his crate and does quite well at night. He whines for about 5-10 mins when we first put him to bed, but then settles in and sleeps until about 1am when he lets us know he needs to go for a pee and then he sleeps until about 5:30 or so. My husband is an early riser so he gets some puppy time early in the mornings. He has had one small accident in the house since we got him……we take him out every 30-60 minutes and he lets us know when he needs to go out in between. He sits at the back door and whines to be let out! He’s a smart little guy that adapts well. He already sits nicely and waits for his food bowl to be put down no matter who is feeding him. He is an easy going but playful fellow. He loves snuggles and belly rubs, too. We are just delighted with him. He is a really good match for us. I will send you some photos in a couple of weeks if you want to use them on your site. 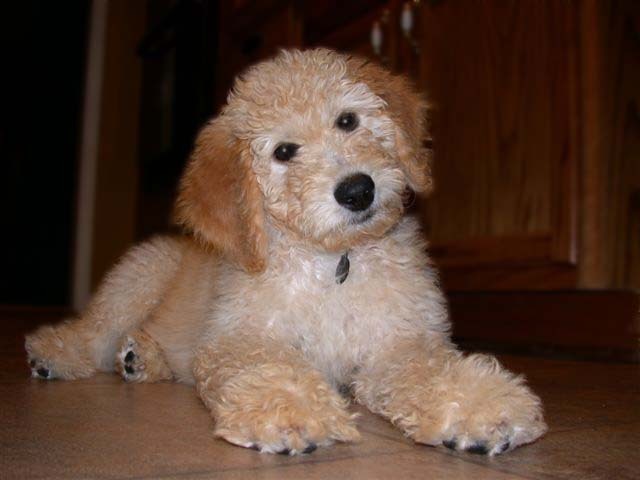 Linda, I would like to take a minute to thank you so much for our labradoodle Cooper. Cooper is an amazing dog for our busy, action filled family. We have four children ages, 6, 9 ,11 and 13 and seem to always have an extra three or four children in the house. Cooper, as everyone has commented, is an unusually gentle puppy. He is carried a lot by the kids and is consistently very sweet and gentle with all of them. The support and advice from Linda at Copper Canyon is above and beyond. She was extremely patient with us rookie “dog owners” and provided us with great advice that has helped us ensure Cooper feels safe and secure in our home. This feeling translates into a very happy dog. 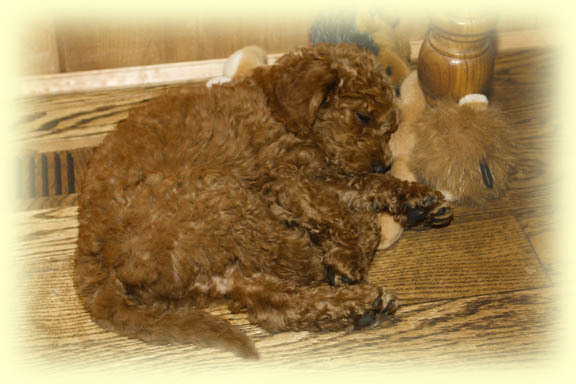 I would not hesitate to recommend a dog from Copper Canyon, Cooper has exceeded our expectations, and we could not ask for better service from Linda, thank you so much for providing us with such a wonderful new addition to our family. I would like to give you an update on our puppy (aka Nicky Red Diamond Collar). As you heard, her name is Brydie. 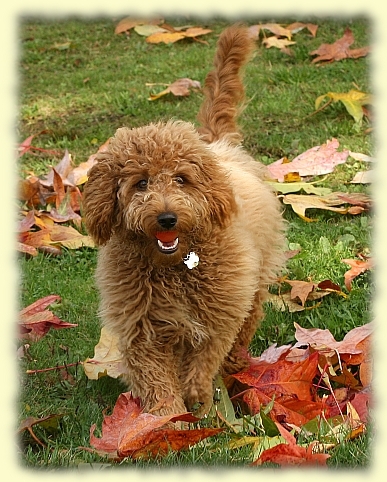 She is a wonderful addition to our family, great temperament, very bright and playful. She likes to be around all members of the family. She is a social being, with people and with other dogs. She likes to retrieve things, on land and in the ocean. She has been in ocean a lot this summer. midst of dog training classes. Thank you again for your choice and for your breeding practices. If I remember right you kept a member of the litter? Here are some pictures from within the last month. 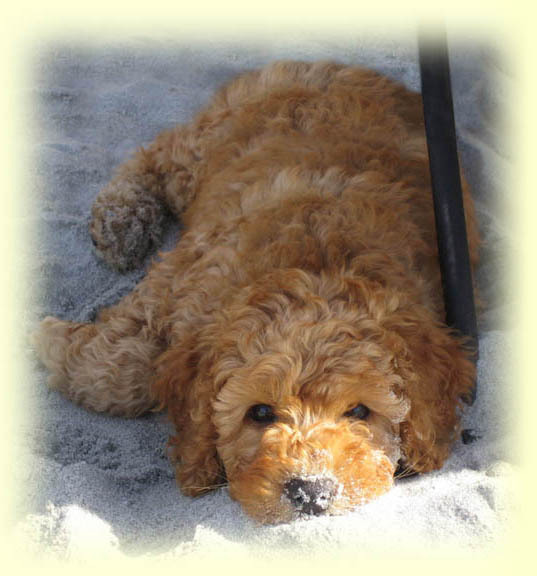 Here are a couple of photos of Lucy – the sandy one was taken on Hornby Island. She Loved camping and was adored by hundreds. We kept her away from dogs, but allowed small girls to worship her! They are already over a week old. We’ll send some current ones soon. I meant to email you sooner but this past week has flown by. Charlie was amazing on the plane ride back. He whined thru the long security line, but once we got him on the plane, he slept for virtually the entire flight. The stewardesses were so nice – they let us keep the top of the carrier open so he could stick his head out the entire time. and has met some of the horses (while being held in our arms). We have already had him up to our lake house. He is very adaptable and quickly learns the layout of new places. He loves meeting new people. Yesterday we took him for a mile walk up and down the hills and he was full of pep the whole way. He also played with Bella! They had a great time together. He is very feisty when he plays with her and holds his own with her. He is still waking up once per night, but last night he made it to 4:15 and then went back to sleep until 6. We have started to train him to sit and come. He is very food motivated! In short he is quite perfect for us, and we are all in love with him. It was so good to meet you. Thanks for bringing us such a wonderful puppy. Tina and her family did not get Reilly from us, but they contacted us to help them overcome a problem they were having with her. They put our suggestions to use and this is the letter and one of the pictures that we were sent… a great success and the beginning of a “happily ever after” story. My husband said that you were interested in how we got Reilly to be more relaxed around Chris. Once we knew it wouldn’t harm her for him to be more assertive, I stepped back and let him do the everyday common things. then feed Reilly her food. In the meantime, we started watching “The Dog Whisperer” and I was very happy to see that we think the same way as he does, so it was refreshing to see a common sense approach to training a dog. What it did for Chris was showed him that he needed to become more calm assertive instead of intense assertive. Once he realized that he was constantly tense when working with Reilly, he started to relax. We would go on walks together with Reilly. He watched me walk her with a very relaxed state of mind, and when she stepped out of line, I would snap the leash and get her re-focused. He then took the leash and learned how to relax….. I kept him talking about work (which he enjoys) and after awhile he realized she was walking with him and wasn’t trying to get away from him. Treats are only given when Reilly earns them through sitting, coming, staying and then of course I like to do the fun tricks such as shaking a paw and rolling over. She is a quick learner and we are having fun. I am trying to figure out how to teach her to put her toys away in her toy box…. she sure knows how to get them out!!!! Chris is working with her on staying. She sure likes when he comes home and has a treat for her….. even when she has to sit and stay in another room while we sit and chat in a different room until he releases her from staying. When he comes home, she goes over and greets him. We are all practicing not petting her until she is sitting. Our 15 year old daughter is also learning to establish a calm assertive role in Reilly’s life. At times she gets frustrated and vows she will never have kids or a puppy….. it is too much work!!!! We chuckle and then set her in front of the TV to watch Dog Whisperer. We see Reilly finally responding to her the proper way. Still a lot of work but progress has been made. There are times when Reilly needs the leash on around the house to remind her that she is the dog but for the most part she is doing great. Since I am a stay at home wife, I spend a lot of time with Reilly so she naturally gravitates towards me, but I am learning how to step aside when the rest of the family is home. I don’t mind her liking me so much, but I want the rest of the family to feel like they have a pet also. Our last dog Trixie (shepherd mix) was my dog and no one else’s… the problem was she couldn’t relax unless I was with her. She was a very obedient, well trained dog, she just wanted her “momma” .Had I known what I know now, I would have helped her not be so co-dependent on me…..but she died from cancer July 21 and there is nothing I can do to change that now. So in her memory, we are going to do things better for Reilly. I will send some more pics. Hope this finds you and the family well. 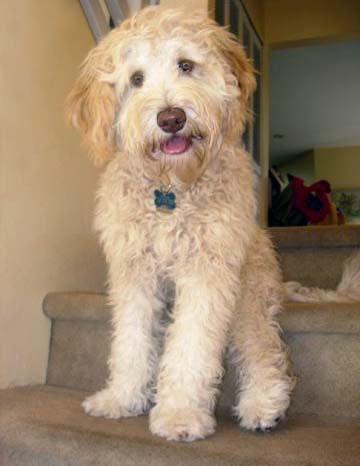 I am attaching 2 of the latest pictures of Finnegan, 8 months old now. He is great dog and has a soul filled with joy and fun! He is (8 months old now) topping the scales at 32 lbs but is still skinny as a rat under all his fur. Finnegan is very smart and catches on quickly. He is eager to please, LOVES to play and be outside. He is turning out to be great hiker, and makes sure he visits everyone and everydog along the way. He loves swimming and showers – really anything to do with water. He also enjoys our trips to the Home Depot – loves the people, smells and treats! Finnegan not only brings great joy to me, but has become my neighbours’ honourary dog. He has folks who vie to take him for a walk to the park where they play ball for hours. He visits the older couple next door on a daily basis and tries his best to get a treat from them (she is a wonderful cook and Finnegan has figured that out!). I could go on for some time about Finnegan but wanted to thank you. Finnegan is tribute to the good breeding program you have. I can’t walk down the street with Finnegan without being stopped and told he is the cutest dog they have ever seen and want to know where I got him! I wanted to ask your advice about jumping up. He does not jump on me (knows he is not allowed) but does jump up on some folks (not everyone) particularly when they come to visit our house. I am trying the leash on at home when I know someone is coming over. I can hold him and encourage no jumping – both praise and/or firm tone as needed. I don’t want this to become a chronic problem particularly as he gets bigger and stronger. What do you suggest? BTW, I followed your advice about making sure I was always out of the house first when we go on walks. It has made a difference. Thanks Linda, I look forward to hearing from you.